OUCET2018 Counselling ,Web Options Osmania PGCET Certificates Verification Dates @ oucet.ouadmissions.com/ OUCET/ PGCET 2018 subject wise Exam dates, Hall Tickets, Results @ oucet.ouadmissions.com/ OU PGCET 2018 Notification| OU PG Entrance Test Exam dates, Schedule, Online apply now: OU PGCET Notification 2018 : Exam date, Notification, Online Application form, Exam Pattern, Important dates, Eligibility, How to Apply, Last date for Apply online, Exam pattern, Test centers and other details given below Osmania University Common Entrance Test Commonly known as OUCET 2018 notification and examination details will announced soon by Osmania University, Hyderabad on behalf of Government of Telangana. Applications are invited from candidates who intend to take admission into various P.G courses M.A, M.Sc., M.Com, M.C.J, B.S.Ecs., M.L.J.Sc., M.S.W, M.Ed., M.A.Ed., PG Diploma Courses and 5-Year Integrated Programmed offered by the Osmania , Telangana, Mahatma Gandhi and Palamuru Universities in their campus, constituent and affiliated for the academic year 2018 -2018. Eligible and interested candidates may submit their applications through online at official website. It is hereby informed that the exercising of 3rd Phase of web options for all the qualified candidates of OUCET-2018 : The candidates exercising 2nd phase web options must note that the web options exercised during 1st phase are no more valid and stand cancelled completely. Therefore, all the candidates have to exercise their web options freshly for possible sliding and for new admissions. The detailed notification and related instructions will be made available in the website, www.ouadmissions.com. Candidates are advised to go through these instructions carefully.Note: Provisional allotment and subject wise schedules of Certificate Verification will be available in the website final phase Allotment Results available. 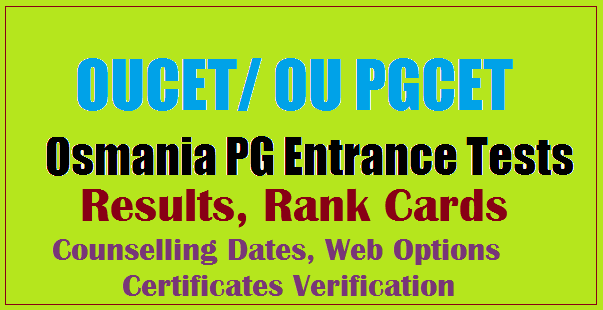 OU PGCET /OUCET 2018 2nd/3rd/ Final Phase Web Options Results- Seat Allotment List. Notification for Final Phase of Web Options in Osmania, Telangana, Mahatma Gandhi and Palamuru Universities, its Campus, Constituent and University PG Colleges. 2. All the candidates have to exercise their web options freshly for possible sliding and for new admissions. The detailed notification and related instructions will be made available in the website, www.ouadmissions.com. Candidates are advised to go through these instructions carefully. The schedule for certificate verification/sliding of allotted candidates will be available along with the allotment. 1. All the candidates, who have qualified in OUCET-2018 entrance tests can exercise final phase of web based options in the respective subjects and choose the colleges as per the candidate’s preference. The exercising of options is open to all whether they have exercised options during 1st Phase, 2nd Phase or not. Candidates should note that the web options given by them during first and second phase are no more valid and stand cancelled automatically. Therefore, all those candidates who wish to slide their admission to a better college/course must also exercise the options freshly. c) Web based provisional allotment of candidates to colleges (based on options exercised and Rank & Reservation). d) Certificate verification of candidates, who are in the provisional allotment lists. e) Issuing of provisional admit cards, if eligible and after payment of the requisite fee (fee details are available in the website). 7. Since it is final phase of web options, candidates are advised to be extremely careful in exercising the options. Those who have already taken admission must note that in case they give options and if they get the allotment, their previous admission will be automatically cancelled. In case they don’t get any allotment, their previous admission will remain as it is. 9. All those candidates, who are in these provisional allotment lists will be called for certificate verification / sliding of admission and will be issued admit cards provided the candidates are eligible as per the rules. The schedule for certificate verification / sliding of admission will be intimated through website, www.ouadmissions.com along with the allotment lists. All the candidates, who have qualified in Osmania University Common Entrance Tests - 2018 for admission into various P.G. courses (M.A., M.Sc., M.Com., M.S.W., M.C.J., B.Lib.I.Sc. / M.Lib.I.Sc. (2 yrs.) Course, etc.,) offered by Osmania, Telangana, Mahatma Gandhi and Palamuru Universities in their campus, constituent and affiliated colleges, are hereby informed that the Online Registration Process and Exercising of Web Options for all eligible candidates will be open from 13.07.2018 to 16.07.2018 . Once the process of exercising of web options is over, a provisional allotment list of candidates for possible admission into various courses in various colleges will be generated through web based counseling. After this, only those candidates, who are in the provisional allotment list, will be called for certificate verification for the purpose of final allotment of the admission. All the candidates are hereby informed that the 1st Phase Certificate Verification of the candidates, who are provisionally allotted for admission into different PG courses in different colleges for the academic year 2018 -18 through web based allotment process, will be conducted from 26.07.2018 . The day wise and subject wise schedules of certificate verification and related instructions are available in the website. The PH Quota admissions will be held from 02.08.2018 . The NIQ & CAP admissions will be held on 03.08.2018 . Further, the NCC/NSS/Sports Quota certificate verification and admissions will commence from 05.08.2018 . The Candidates are advised to visit the websites, www.osmania.ac.in and www.ouadmissions.com for subject wise and category wise schedule in detail. Candidates should note that the certificate verification is only for those candidates who are provisionally allotted an admission through web based allotment process. 1 02.08.2018 09.30 am Physical verification of PH candidates for the subjects of M.A. in Economics, Sanskrit, Urdu, Public Administration, History, Political Science, Linguistics, Telugu, Islamic Studies, English, Arabic. 2 03.8.2018 09.30 am Teacher/Lab. Asst. Category Admissions for M.Sc. Mathematics, Physics, Chemistry, Botany and Zoology courses. 3 04.8.2018 09.30 am Physical verification of PH candidates for M.Sc. Mathematics, Statistics, Chemistry, Botany, Zoology subjects. 4 05.8.2018 09.30 am NCC/NSS/SPORTS quota verification and admissions for the subjects of M.A. in Economics, Sanskrit, Urdu, Public Administration, History, Political Science, Linguistics, Telugu, Islamic Studies, English, Arabic. 5 07.8.2018 09.30 am NCC/NSS/SPORTS quota verification and admissions for the subjects of M.A. in AIHCA, Philosophy, Psychology, Hindi, Sociology, Theatre Arts, Journalism and Mass Communication, B.Lib.I.Sc. / M.Lib.I.Sc. (2 yrs. course), M.S.W, M.Com courses. 6 08.8.2018 09.30 am NCC/NSS/SPORTS quota verification and admissions for M.Sc. Mathematics, Statistics, Chemistry subjects. 7 09.8.2018 09.30 am NCC/NSS/SPORTS quota verification and admissions for M.Sc. Physics, BCBTESFSG&M, Nutrition & Dietetics, Computer Science courses. 1. Based on the merit in the entrance test. 2. Admission into of college depends on it Recognition / Affiliation by the statutory bodies and option of the college exercised in counseling. 4. Admission to 85% of seats shall be reserved for local candidates and 15% of the seats shall be left unreserved of specified in the AP Educational Institution order 1974 as amended. Qualifying cutoff mark in the entrance test is 25% (25 marks out of total 100 marks). However for candidate belonging to SC / ST no qualifying percentage marks is prescribed. The fee may be paid at any TS Online / AP Online centers and also through payment Gateway ( Credit Card / Debit Card / Net Banking). In case a candidate want appear for than one test separate registration fee has to be paid for each test. 1.Candidate should be of Indian Nationality. 2.Candidate should be belong to the state of Telangana only and should satisfy Local / Non-Local status requirements as laid down in the Telangana State Educational Institutions or 1974 as subsequently amended. The candidate other than Indian National should satisfy the rules of the Universities concerned. 1. All the courses are of two years duration. 2. Candidates should have passed B.SC, B.A (or) equivalent examination will not less than 40% in the aggregate (Part-2) (In case of SC / ST candidates a pass in the qualifying examination is sufficient) and studied the subject is given official website. 3. Candidates passing the Bachelor’s Degree examination compartmentally are also eligible provided they secured not less than 40% aggregate marks and pass in the qualifying examination is sufficient for SC / ST.
4. Candidate who are appearing / appeared for the qualifying examinations are also eligible to apply for the entrance test. Candidates should be required to produce marks memo and pass certificate at the time of admission. 5. Must ensure their courses eligibility / equivalence before appearing for the entrance test, given in official website. There is no age restriction for OUCET (Self Financing) . However maximum eligible age for obtaining a Fee Reimbursement in respect of SC / ST and BC is 34 Years and in respect of EBC / Minorities / Disabled id 30 Years. The candidate after satisfying the eligibility criteria OU PGCET, after applicant has to register for before filling the application, then login using the application number and password. After filling the application, then pay the fee (Online mode). Candidate shall take printout of the application and store it for future use. The registration and submission of application form in involves following steps. 2. Now click on the “Apply Online" link, then new webpage appear on the screen. Then click on the "Registration" link. Hall ticket number / Year of passing, place of study, percentage for qualifying examination. Hall ticket number, year of passing, place of study for S.S.C or equivalentPersonal details for Name, father name, mother name, mobile number, aadhaar number.....etc. Caste in case of SC / ST / BC candidate. PH, NCC, NSS, CAP, Sports, .etc. Income up to one lakh or two lakhs or more than two lakhs. Study or Residence or Relevant certificate for proof of local status. Choice of help line centers is for certificates verification and options at the time of admission. 10-06-2018 M.A. Sociology M.Ed. M.P.Ed. 1. The candidates are advised to download the Hall Tickets, without which they will not be allowed for entrance tests. www.osmania.ac.in from 01.06.2018 (5 pm) onwards.